Security blankets are supposed to comfort us; they are supposed to protect us from harm. Oklahoma City artist Autumn Brown explores her idea of a security blanket within her Concept/OK Survey exhibition piece, Baby Blanket. In Baby Blanket, a part of Brown’s Security Blanket series, warm feelings are most assuredly not the underlying intent. Instead, what you are offered is a harsh juxtaposition between a rusted grate and delicate, woven ribbon. Brown relates this juxtaposition to the comforts and discomforts of life itself, rousing the idea that the very things we do to feel secure might be damaging forces we use to blanket ourselves. Q: What inspired you to create your Concept/OK Piece? AB: The actual piece? I was digging through a scrap yard. I liked the rusted grate and brought it home. “Stewed” over it a while and then the piece happened. Q: Ribbon is used quite often in your work. Is there any significance to this? AB: I love the juxtaposition of soft fiber and hard rusted metal. I am fascinated with the dialog between setting two such different materials against each other. I enjoy using these materials, to express the duality that exists in our daily lives. Ribbon seems to be one of the “more refined” versions of fibers/fabric, a perfect “match” to oppose harsh rusted metal. Q: Has mixed media always been the media in which you work? AB: No. Started like most artists, who start young, in 2D. I excelled in most mediums while studying art in college, though I found the dark room daunting and lonely. During my required Intro to 3D class at Savannah College of Art and Design I discovered a new world of art. From then on I have embraced 3D art as my main artistic pursuit. Fiber Art (or mixed media if you will) evolved from there. Q: Can you describe the process in which you create a mixed media piece? What is your first step? AB: Mentally, I prepare ideas for a group of work. I settle on an idea and then work it into a “thesis.” Then I start brainstorming through sketches and research. I run these sketches pass my thesis to make sure they match up. I refine sketches then make a list of needs. That is when the fun starts! I head to salvage yards, thrift stores, and junk yards. After I collect everything I “think” I will need I start constructing. Some pieces work out exactly as I planned. Some pieces have to be reworked. Then there are other pieces that come to birth sporadically during the above process. These work themselves out a little less structured that the earlier but still go through a “refining” process. Of course no matter what I am doing (cooking dinner, sleeping, laundry) I am working out ideas in my head. The Concept/OK: Art in Oklahoma exhibition is open to the public through February 16, 2013 at the new Tulsa Arts and Humanities Council’s Hardesty Arts Center. See www.concept-ok.org for more information. 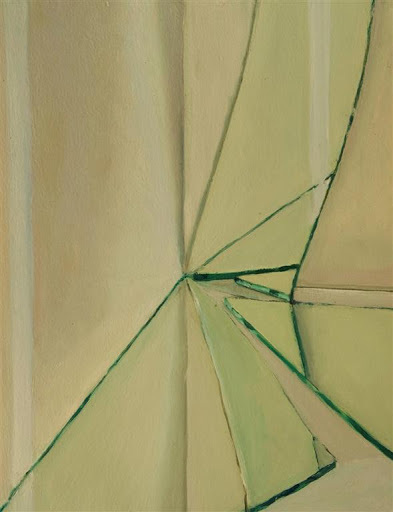 Tulsa artist Cathy Deuschle perceptually paints light and geometrical elements at their finest in her Concept/OK Survey exhibition pieces, Mirror Fragments. Through the use of oil paints and a keen, patient eye, Deuschle manages to capture the way in which mirrors reflect light onto each other. 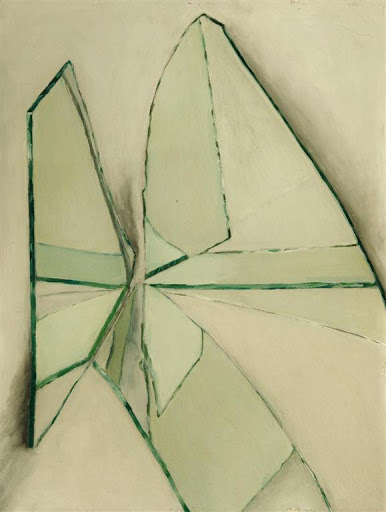 Each mirror fragment reflects a view across from it, which makes a ‘window’ appear to form a complex open ‘landscape’. These mirrored ‘landscapes’ serve as a study of light, geometry, and composition. Deuschle informed me further of her inspirations and intent of Mirrored Fragments. Q: What inspired the creation of your Concept/OK piece? CD: The paintings selected for the Concept OK show are from a series on mirror fragments reflecting into each other within white surroundings. Though mirror reflections have entered my work before, the impetus to focus on them came after seeing Olafur Eliasson’s light installations at MOMA. 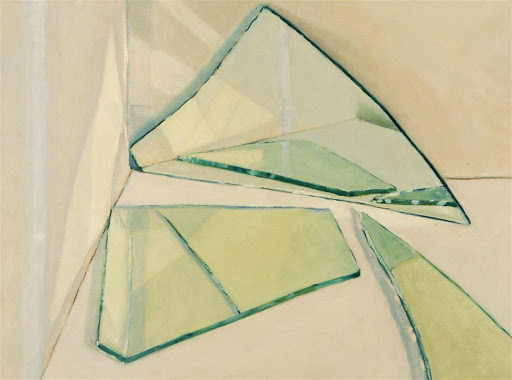 I wanted to explore and interpret with paint that same interesting intersection of light, reflection and geometry using the sources and materials familiar to me: oil paint, local light, and common mirror glass. In painting these, the phrase ‘lost in translation’ deepened in meaning because the attempt to approximate the ever changing light is very plainly restricted to what the pigments, time, and my perception will allow. Because of this, calibrating color relationships and locking down the drawing was of heightened importance. I chose broken mirror pieces because the irregular shapes signified them as objects with individual character as well as utility. These pieces were entirely painted from direct observation. Q: What is your favorite medium in which to work? Why so? CD: My favourite medium is oil paint. It is a fluid and direct means of expression that allows for a lot of reworking which I tend to do. I love the buttery consistency, it’s responsiveness to touch, and the traces of personality that come through in the brushwork. Q: What do you want viewers to take from your work? CD: This work asks the viewer to consider the meeting of representation and abstraction, the elemental nature of light, and the value of subtlety. 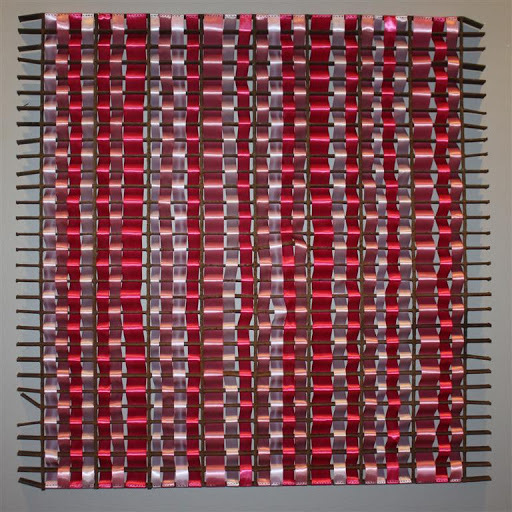 Deuschle won an Award of Merit chosen by the guest curator Liza Statton. The Concept/OK: Art in Oklahoma exhibition is open to the public through February 16, 2013 at the new Tulsa Arts and Humanities Council’s Hardesty Arts Center. See www.concept-ok.org for more information. Light. Place. Time. These are just a few factors that Edmond artist Marcus Kesler takes into account before making a photograph. His Concept/OK Survey exhibition piece, Taft, further explains why light is so important. For each photograph Kesler makes, he uses light and the color of light to tell a story within the locations he shoots. Most of his locations have a history, especially this clump of ruins in Taft. The state of this location is what inspired Kesler to plan and capture the image. 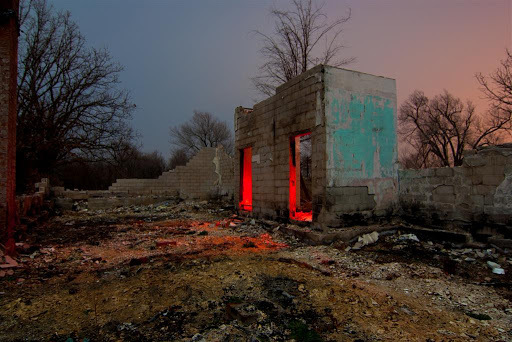 He describes the ruin looking as if a fire made its way through it; the red light you see mimics the supposed fire. Kesler informed me further as to why and how he uses light to breathe life back into these rather lifeless locations. Q: What is the process in which you light your subjects? What kind of lights do you use? MK: After taking a neutral photograph using only ambient light to get a good feeling for the subject that I am photographing, I start walking around the area and use a handheld flashlight to illuminate different areas of the scene. I try to get a feeling of how certain areas stand out once they are painted with light and I try out different colors to see how they complement the atmosphere that is already there. The goal of the light painting is to help the object or place tell its story and to share the emotions that are already present. Once I have an idea of how to do that, I start taking 3-5 minute exposures of the scene and then use that time to move around and manually paint individual scenes with light using a variety of flashlight and a handheld strobe, both covered with different colors of theater gels. The setup is very portable and fits in a small bag that gives me the mobility needed to travel in and out of different areas at night. Q: How do you determine which location to shoot? MK: The general areas are either determined through research or pure luck, often both. During my process of photographing historical African-American towns in Oklahoma I spent a lot of time at the Oklahoma Historical Society looking over old maps and land surveys to find the locations of towns that no longer exist. Once I found the general locations of these towns I used satellite maps to see if I could find any sings that there are still buildings to photograph. But the majority of locations are found by simply driving around the state while keeping an eye out for locations with potential. Sometimes it is fairly easy and you just happen to come upon an old abandoned gas station. When I do find a location I try to spend at least 5 minutes just walking around the area before setting up to take a picture to feel out the location and to let it tell me what kind of story it wants me to tell. Q: Do you work in any other photographic medium, such as large format, or do you strictly practice digital photography? MK: I strictly practice digital photography at this time. The instant feedback and being able to review your ideas is a very valuable ability to have. There have been many times where I have thought that something would look wonderful in a certain color, only to find that the material that I was painting absorbed all the color and almost nothing was visible in the final picture. Using digital allowed me to identify that problem and correct it on site. Digital also has certain benefits over film when it comes to long term exposure and being able to calculate the amount of time needed for each picture. 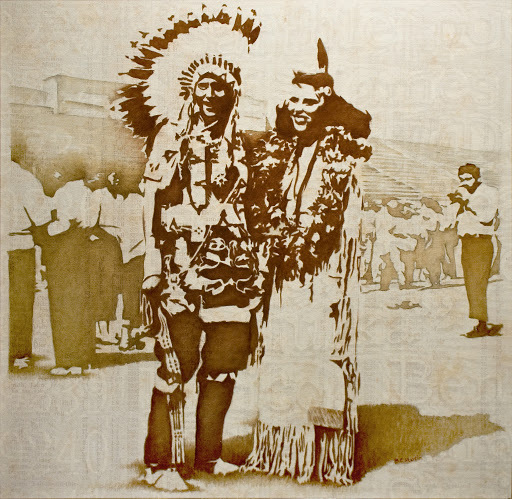 Tahlequah artist Bobby C. Martin’s piece for the upcoming Concept/OKexhibition, Homecoming Royalty, layers images and icons related to his identity as a self-defined mixed-blood native artist from Oklahoma to define his unique experience of Native American culture. Although he borrows photos primarily from his family’s collection, viewers across cultures of often identify with the Martin’s artworks, which bring to mind shared memories and experiences of events past and present. BCM: This piece is about cultural identity from my viewpoint as a mixed-blood native person living in Oklahoma today. In this piece, and indeed much of my artwork, many layers of identity merge in an attempt to define a personal and cultural history. The list of names and numbers taken from census rolls (the infamous Dawes Rolls) are one layer of identity; the image itself is another layer; and the subject matter of the piece itself, with its potential for political “incorrectness” is yet another layer. The photo that inspired this piece was from my mother’s collection of photos from her time at an Indian Training school in Lawrence, Kansas. This photo dates from c. 1952-53 and is a shot of the football homecoming king and queen. No one can remember who the couple was in the shot. I’m kind of hoping someone sees the couple and recognizes them, which has happened in my works before. CL: What particular process do you employ to execute your works? BCM: What is never consistent is the process or media I use to create my art. I am primarily a printmaker, and have long been interested in layering—whether in content, materials or techniques. My process often begins with a layered digital image manipulated in Photoshop, where I take a scan of old photo and add other bits and pieces of text, textures, etc. From there it can go anywhere—oil on canvas, collage on paper, monotype, mixed media print. CL: What do you hope viewers take away from your art? BCM: Even though I use mostly photos from my own family’s collection (who happen be Native American), I have found an almost universal response from viewers across cultures, ethnicities and languages that has made me realize how the common bond of family and collective memory contained in these photographs can have a profound effect. I also often combine words in the form of historic Indian census rolls, snippets of Christian hymns in the Muscogee language (my tribe) and passages from the Bible to inject additional layers of meaning into my works. So my hope is that viewers can find a stirred memory or identify with their own family history in my work—and in turn reflect on their own family and identity. The Concept/OK: Art in Oklahoma exhibition opens December 16, 1-5 pm at the new Tulsa Arts and Humanities Council’s Hardesty Arts Center. See www.concept-ok.org for more information. 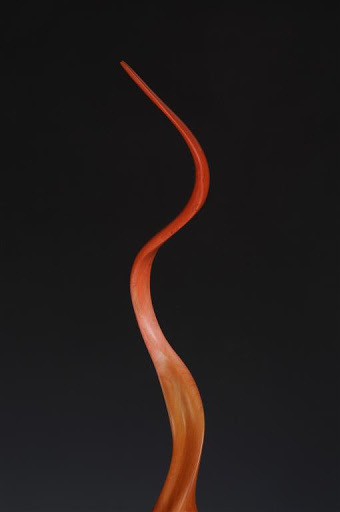 Woodturning artist Bob Hawks draws weightlessness from his medium. His Concept/OK: Art in Oklahoma piece Where There’s Smoke, demonstrates not only an unspeakable level of craftsmanship, but also an observance and translation of outdoor space and movement. Supplementing that observance, his preference for wood salvaged from damaged construction or storms breathes life back into the abandoned pieces he finds. I was able to ask the Tulsa artist a few questions about his history with art, technical process with woodturning, and inspiration behind designing ‘dead’ wood back to life. 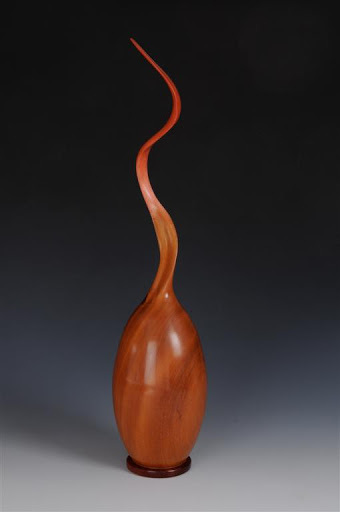 Q: I understand that you switched to woodturning after 35 years of photography. Are there any fundamentals of photography that translated over to woodturning, or was there a distinct disciplinary jump? BH: From a mechanical standpoint, it was a big jump. When it came to designing pieces in woodturning, many of the same ideas and good design apply to both good photography and woodturning. Q: Your pieces look virtually seamless; does this happen with careful planning, or does the wood take on a life of its own to a certain degree before you decide what it will look like? BH: Segmented pieces start with dry dimensional limber and precise drawing. This pretty much dictates what the piece will look like. In the case of vessels turned from green logs, many times the wood grain, color, and texture of the log dictates what will happen as you turn. Usually I start with a design in mind, but often that will change as the turning progresses. Q: How has technology transformed your studio? I know that you’ve been working as a wood turner since 1985, is there any process that you would refuse to update, or is there machinery that, when updated, assisted better with your work? BH: The basic concept of woodturning is a handheld tool addressed to a piece of wood spinning on a lathe. That is still the same after hundreds of years. Of course, there have been refinements in the making of tools and lathes, and I take advantage of them when they aid in the process. As far as I’m concerned, the design of the piece is the most important element, not how it was mechanically achieved. Q: What would you say inspires you and your work? BH: Mostly things from nature and the outdoors. Trees themselves, flowers, smoke from a chimney, wind, rain, birds flying, etc. There is a kind of comfort and surreal nature to Tulsa artist Kate Johnson’s Dreamscape pieces. 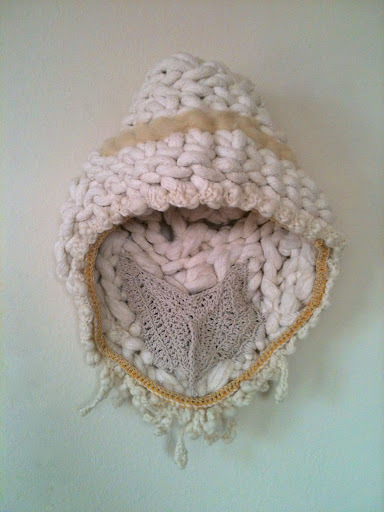 She has created five woven and crocheted forms; none with any recognizable shape or inclination. 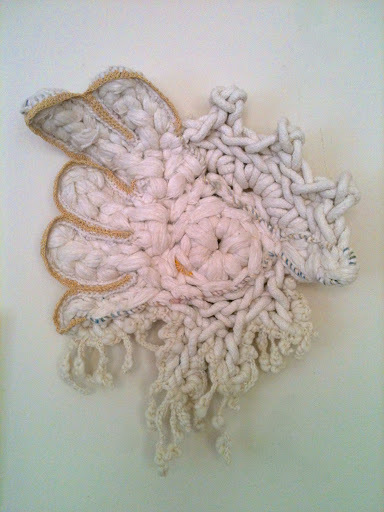 They are all created with half-inch cotton rope and various crochet techniques; the pieces truly form themselves as they are not premeditated shapes. Rather, they are as clouds; taking an unexpected shape from a series of spontaneous movements. Johnson told me a bit about how she came to work with these materials and to what point her process is allowed to operate independently from her design of the piece. Q: Can you tell me a bit about the evolution of the materials you use in your work? Do you think your media will continue to evolve, or are you content in what you work with now? KJ: The fiber work that I’m doing now evolved out of the work I was doing in Grad school. I was casting a lot of different fiber elements in clay slip – everything from clothing to small recliners. That work was all very representational. After finishing a large-scale clay installation I had the desire to explore fiber on its own, which is what led me to making the Dreamscape series. I am enjoying this series, but I expect the work to continue to evolve and change with each new piece. Q: What would you say has been the biggest influence on your work so far? KJ: I think it is sometimes difficult to trace influence, but there is one particular experience in my life that I can say, for sure, has directly influenced my work. 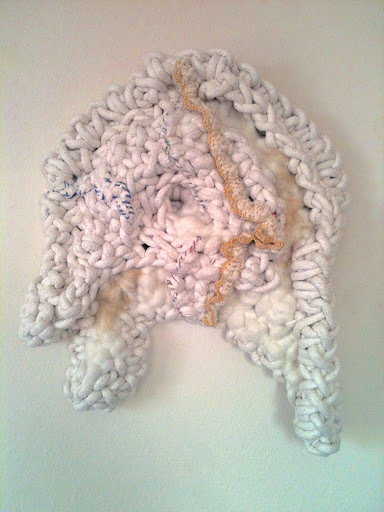 I saw my first fiber art show when I was interning in New York back in 2007. I was aware of the fiber art movement at the time, but it was my first experience up close and personal. I remember feeling like an entirely new world of possibilities had just opened up. I was energized and inspired by almost everything I encountered in the gallery. Q: Where does your technical process start? Is the idea in your head before you begin, or do you start with your hands? KJ: It usually starts with the material itself. The material tends to dictate what direction my hands will go and from there I end up with a raw form. With the Dreamscape series, I knew what size and general aesthetic I wanted, but the shapes were created spontaneously. I usually think I know what direction the shape will hang on the wall, but I almost always end up turning it upside-down or even completely flipping it over to what was originally the backside. At that point I start to carefully plan where the smaller details go and where I will deconstruct or add additional material. Fresh water is a natural, finite resource. Bottled water is a manufactured, commercial product. 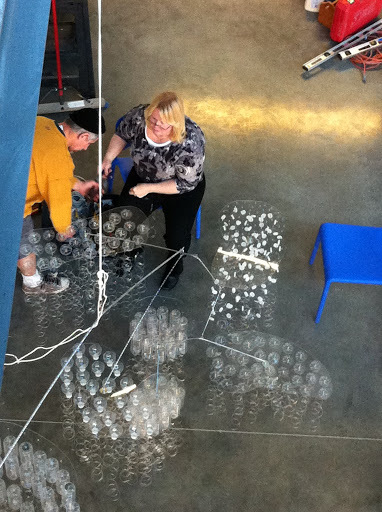 Concept/OK Survey artist Caryl Morgan takes a critical look at both in Bottled Water Rain Shower. This kinetic mobile, constructed from 365 re-purposed water bottles and polycarbonate tubing, requires more than just a passing glance. The translucent materials provide viewers with an unobstructed view. Nevertheless, Newkirk-based artist Morgan hopes the relevant issues of contemporary water usage and ownership are not overlooked. OVAC intern Heather Eck interviewed the artist to learn more. Q: What inspired Bottled Water Rain Shower? Morgan: I live in a small town with an agricultural economic base. The drought has impacted the community in a variety of ways. For two years we have received a letter each month on the questionable quality of the city drinking water. This has resulted in the citizens losing confidence in drinking the local water. Another source of inspiration is a painting series that I have been working on for two years based on vintage neon signs. I have been photographing signs throughout the Midwest and without exception I would see discarded water bottles in the area I was photographing. This made me question the need for these bottles as well as the reason we purchase a free resource in bottled form. Reading news reports across the country, it is evident that water is an issue and led to my own divergent thinking. Who owns water? Why should we pay for water that is the very source of our success as a species? Q: Are environmental issues important to you? Are they prevalent in your work? Morgan: During the ‘60s, I demonstrated for and against issues, including rallies to prevent the building of the Black Fox Nuclear Plant for electricity. The issue of water became more acute when I first moved to Kay County because the artesian well responsible for watering stock went dry. Now the community is very concerned about the loss of crops and the inability to maintain livestock. During the 2012 presidential campaigns, the Republicans talked a great deal about the Canada Pipe line an important issue saying it would bring more jobs, energy independence and restore the economy. What was not said about this issue was that the pipeline runs the length of the Ogallala Aquifer, the major source of water for the Great Plains and the concern that one environmental oil spill could pollute the aquifer for generations to come. Q: What was your technical process in creating this installation? Morgan: I knew what I wanted: kinetic movement and the shimmering effervescence of water. I began cutting off the top and the bottom of the bottles, then by cutting a continuous cut around the body I created long curls. When placed in a group they have a shimmering quality. I then decided to make a mobile to enhance kinetic property. I have made dozens of them over the years because I used the process to introduce student to three-dimensional design and how sculpture functions in space when I was teaching high school. Bottled Water Rain Shower required me to add 3-D pieces to the mobile. I began with twisted wire and then moved to rods with brazed fittings which gave the desired effect and greater capacity for movement. Q: What do you want viewers to take away from this work? Morgan: I want people to take away an aesthetic appreciation of the totality of the piece. People that have stopped by the studio while I was constructing it immediately wanted to touch it and see it move, touching the curls in the same fashion one would run your hand under water to feel. I hope people will leave with questions, not sure what it means but answering those questions with their own meanings and answers. Isn’t that the purpose of art? Based on Bottled Water Rain Shower and in conjunction with Concept/OK, Caryl Morgan is teaching a workshop for 5th-7thgrade students on Saturday, January 26 from 1-3 pm at the Hardesty Arts Center in Tulsa. Participants will be made aware of fresh water conservation as well as ways to recycle and repurpose used water bottles. 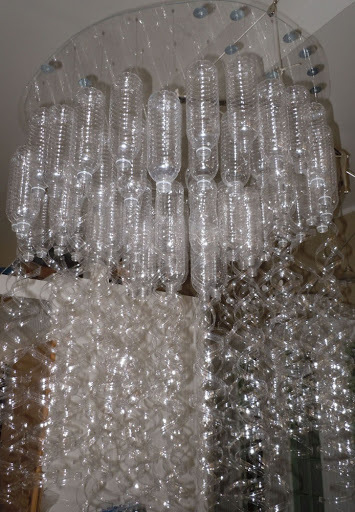 Students will create jewelry, wind chimes, and bird feeders completely from used water bottles.